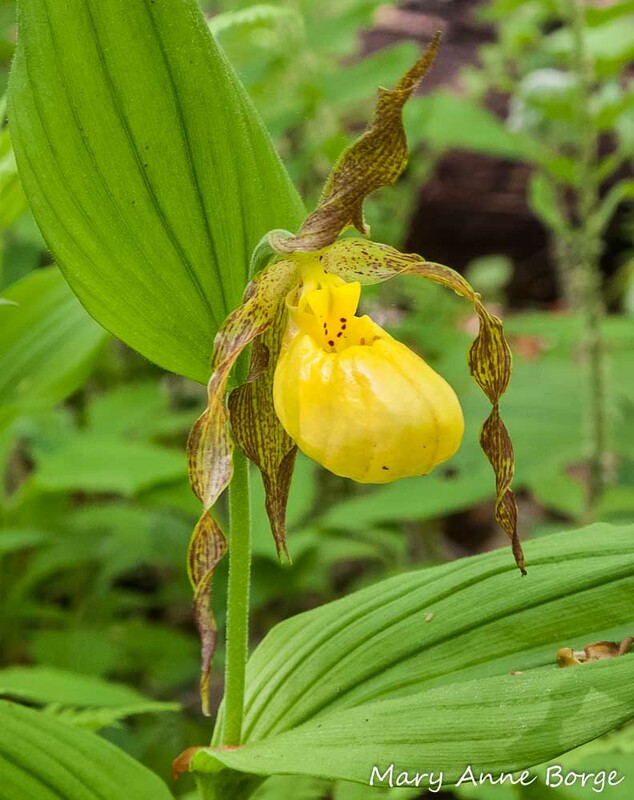 The existence of Yellow Lady’s Slipper (Cypripedium parviflorum) orchids is like winning the lottery, on so many levels. Their bright yellow moccasin shaped petals, complemented by deeply veined lush green leaves, are strikingly beautiful. 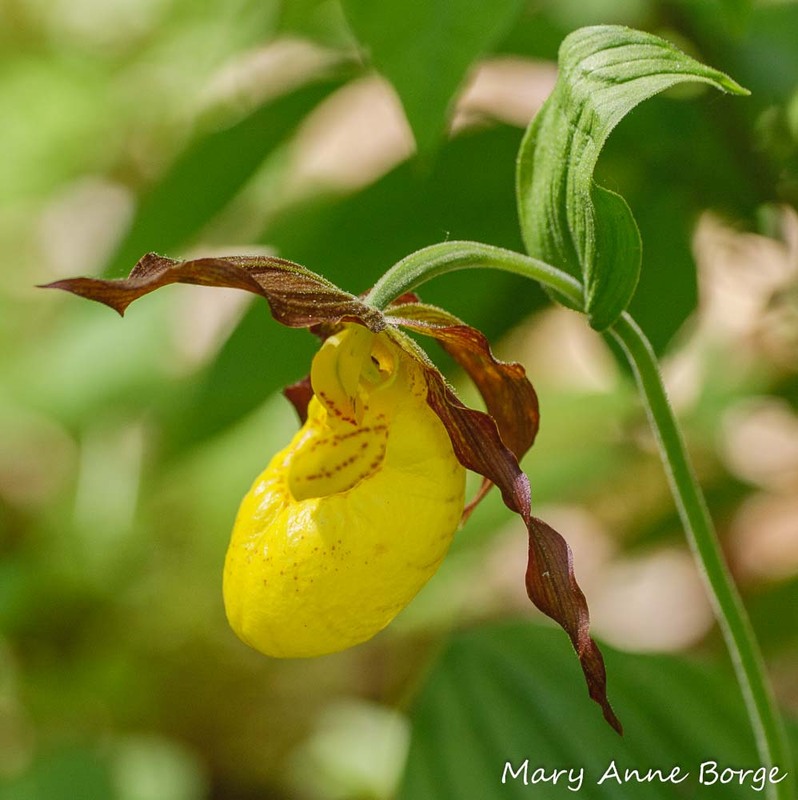 Yellow Lady’s Slipper uses its showy floral display to entice bees to assist in its pollination. 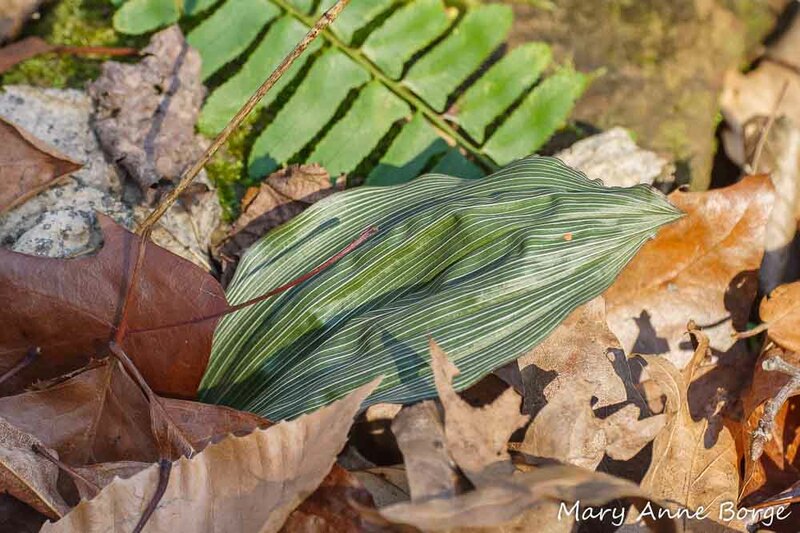 In addition to the bright yellow pouch, the flowers have two more petals, one on each side of the slipper, usually twisted, with striping varying from green to dark maroon or purple. They look like they should be the ties that would be used to keep the slipper on a lady’s foot. The sepals, which can be seen above and below the back of the slipper, resemble the petals. Together, they create a display designed to entice potential pollinators. Bees visit flowers in the expectation of a food reward in the form of nectar, or pollen, or both. 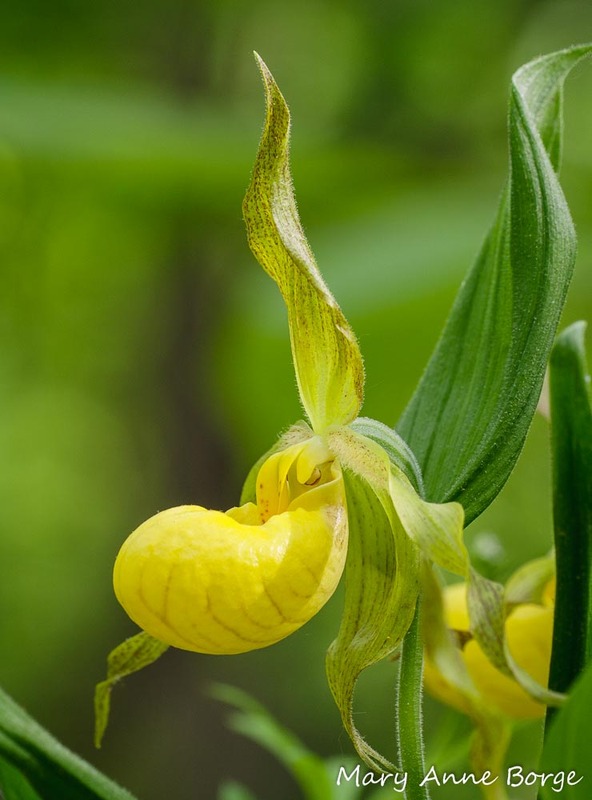 Yellow Lady’s Slippers don’t produce nectar, so pollen is the only possible reward. Once a bee has discovered the flower, more direction is provided. At the back of the opening to the slipper, there is a triangular structure dotted with maroon, pointing downward. This advertisement is the kind of sign the bee is expecting, promising it a reward if it enters the slipper. 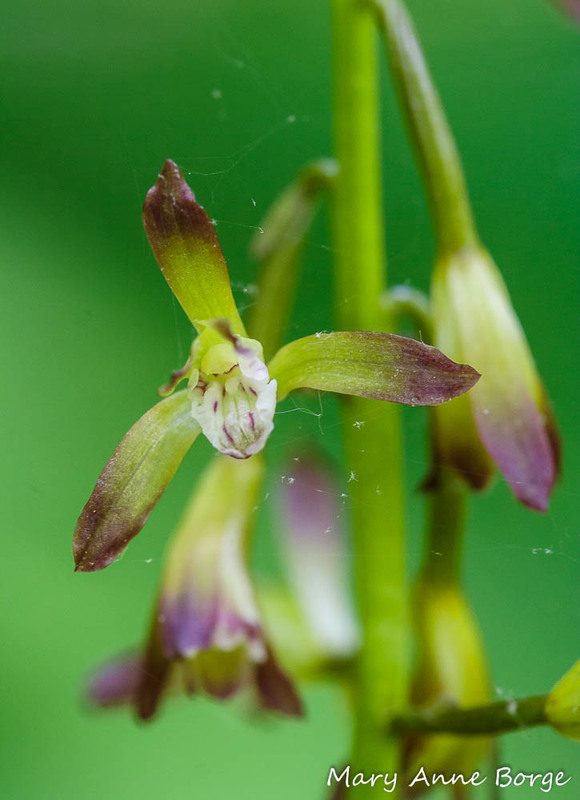 There is maroon-purple striping inside the slipper, pointing to the reproductive parts of the flower, with gland-tipped hairs nudging the bee toward the receptive female flower part (the stigma) first. If the bee has already visited a compatible flower, pollen will be scraped off and deposited, fulfilling the bee’s role in the pollination process. The bee must then pass by the anther, the male flower part where the pollen is found. In many flowers, this would be the bee’s payback. The bee would be able to harvest pollen to bring back to its nest to feed its offspring. But all of the pollen grains of a Yellow Lady’s Slipper’s anther, of which there are thousands, are packed together in a single pollinium, which is attached to the bee as it passes the anther, preparing to exit the flower. The pollen grains are not available to the bee to harvest for its own use. The bee has been duped! The flower advertised falsely, and the bee leaves without a reward. Yellow Lady’s Slipper (Cypripedium parviflorum) Note the maroon striping inside the ‘slipper’. It is usually a medium sized bee, possibly a Little Carpenter, Halictid, Mason or Andrenid, that successfully navigates a Yellow Lady’s Slipper, since the pollinator must be small enough to fit through the flower’s exit hole. If the bee is too large, it may be trapped inside the flower. Perhaps not surprisingly, successful pollination does not often occur. (How many bees are gullible enough to fall for the false advertising twice, the minimum number of times necessary to achieve pollination? Probably not that many.) 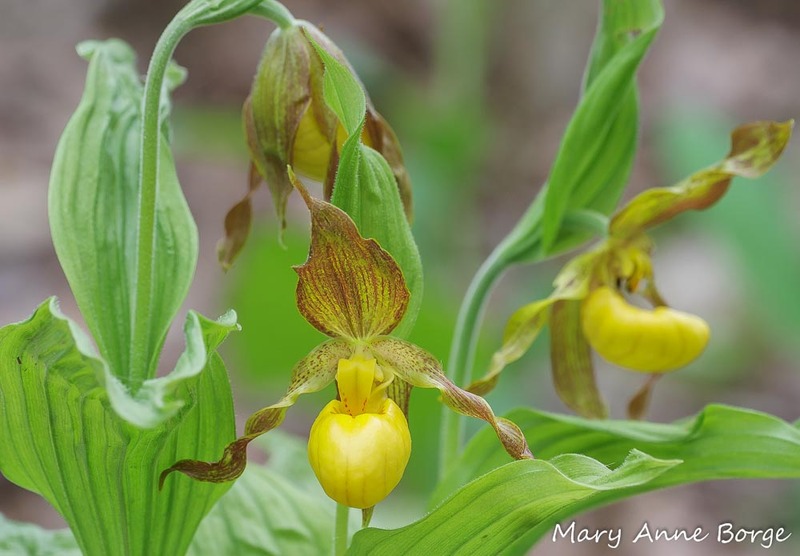 So Yellow Lady’s Slipper makes every successful pollination event count, enabling fertilization of thousands of ovules in the plant that receives them. The result is a fruit capsule that contains thousands of tiny, dust-like seeds that are wind dispersed through slits in the capsule. 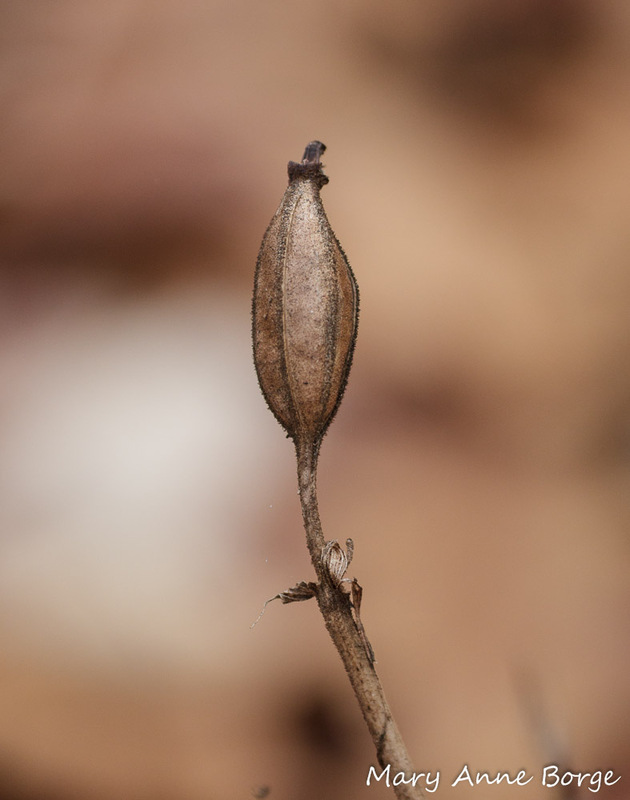 But only a small percentage of the seeds find their way to a location that is hospitable to the plant. 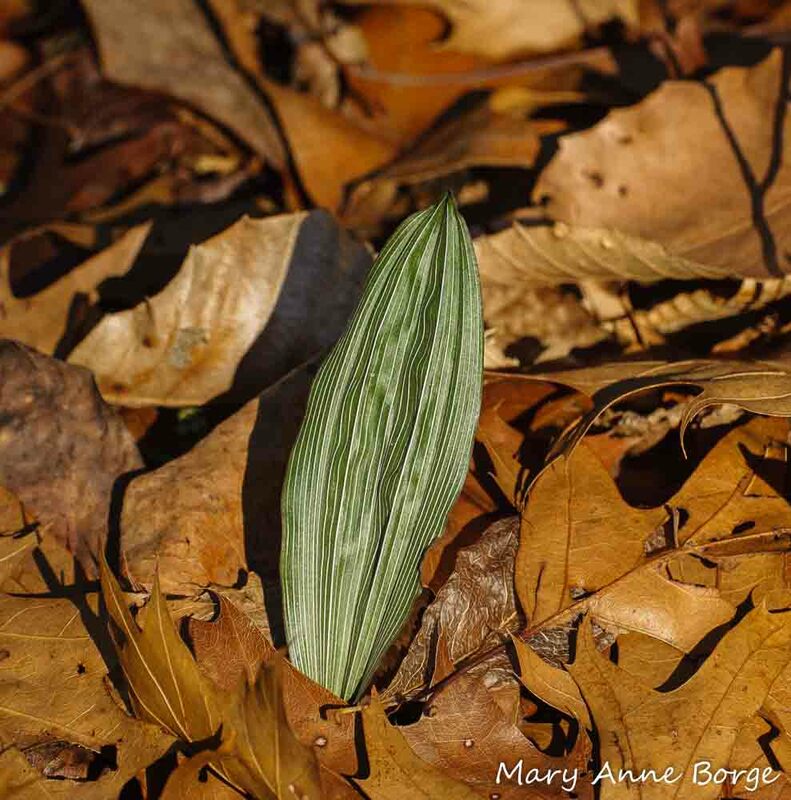 The presence of the right mycorrhizal fungus in the soil is especially important, since it is only through the fungus that the orchid is able to obtain the nutrients it needs to survive. Even if the seed finds the right conditions to establish itself, it can take ten years or more to be mature enough to produce a flower. 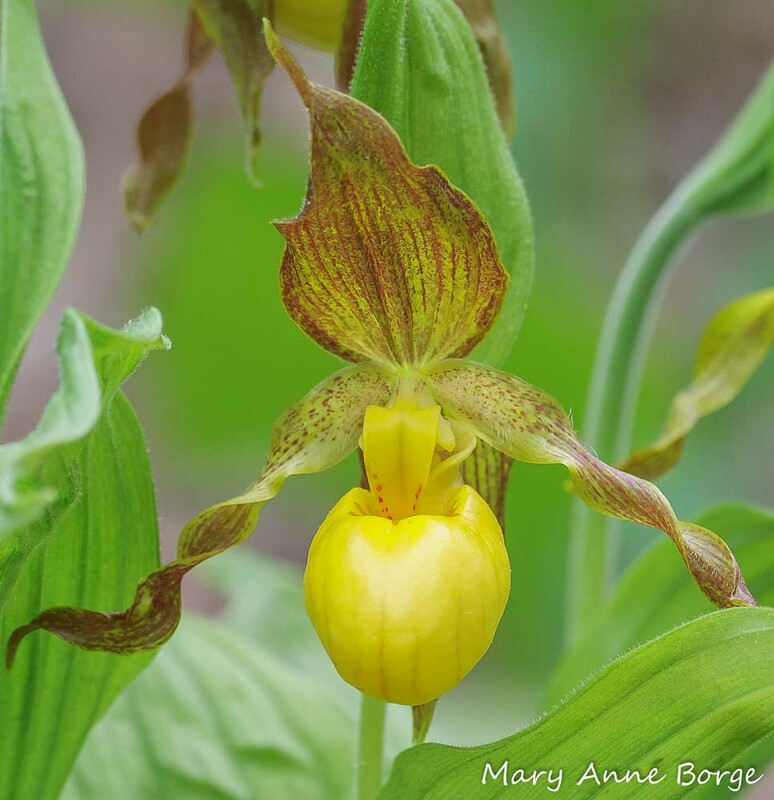 Yellow Lady’s Slipper is fairly widespread, but not common, and is considered threatened or endangered in some states. 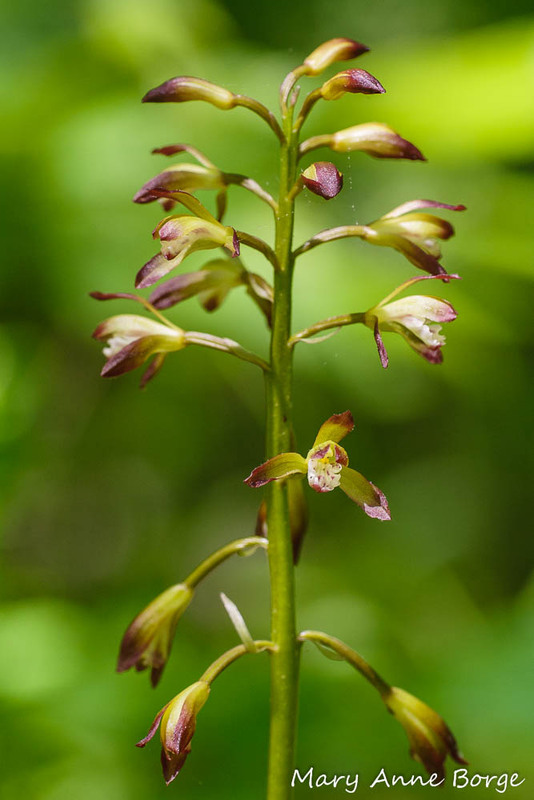 This lovely orchid can be found in a variety of habitats, from woodland understory to meadows and bogs, primarily in the eastern United States (excluding Florida), the Rocky Mountain states, most Canadian provinces, and even Alaska. If you see it, you know you’ve won the lottery. Note: There are three varieties of Yellow Lady’s Slipper. The most common is Greater Yellow Lady’s Slipper (Cypripedium parviflorum var. pubescens). Cypripedium parviflorum var. makasin is often, but not always, smaller, and may have a musty scent. It can be found in the northern part of the range. Lesser Yellow Lady’s Slipper (Cypripedium parviflorum var. parviflorum) tends to be smaller, and has more consistently dark markings on the lateral petals and sepals. It’s range is more southern. Willmer, Pat. Pollination and Floral Ecology. 2011.